Our local distillery scene is fairly young and is going through tons of changes. New items are released all the time and there are loads of fun events happening, which is a very lucky occurrence for those of us who enjoy a good spirit or cocktail, and who like to support local businesses. Check out the below for some recent hits. Get Lucky Falernum by broVo Spirits: Released last fall in Washington (after an inaugural release in Chicago), broVo’s Lucky Falernum has already received a Gold medal from the Beverage Tasting Institute. Created by Danny Shapiro of Chicago’s great Scofflaw and Slippery Slope bars, in conjunction with the distillery, Lucky Falernum is a liqueur infused with ginger, lime, pineapple, star anise, and other bits of deliciousness – but it also carries a bit of a kick at 70 proof. Falernum is a type of liqueur popular in tropical drinks, and one that’s been around for a long time. Sadly, most modern versions are overly syrupy and sweet. Luckily Falernum aims to change that, with a more layered and interesting flavor that goes well in drinks and solo. 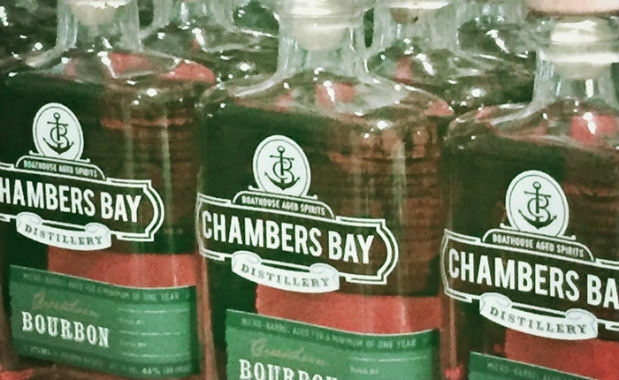 Cadée Released Cascadia Rye and Deceptivus Bourbon: Just released in the last few weeks, the latest bottles from this Whidbey Island (or Isle of Whidbey, as they like to call it) distillery joins its selection of gins, vodka, and its original bourbon and rye releases. Deceptivus bourbon is matured first in new American Oak Barrels, then double barrel-finished in imported 20-year-old age-soaked Port barrels imported from Portugal. The Cascadia rye also started its aging in American Oak barrels, and then was double barrel finished in French oak used previously for 20-year-old Port in Portugal. The whiskies are aged in the distillery’s sea level vault located on the shores of Port Clinton. The results deliver rich and singular aromas and flavors. 2bar In Idaho, Plus Limited-Edition Whiskey: SoDo’s 2bar Spirits is now available in Idaho (along with Washington – at more than 300 locations – and Oregon), which means you can support Washington distillers even when on vacation to our eastern neighbor state. Also, it has announced that it's close to releasing single-barrel corn and rye whiskies. I suggest keeping up on 2bar's social channels, or joining the Whiskey Club, so you can be sure to know when rare release come out.